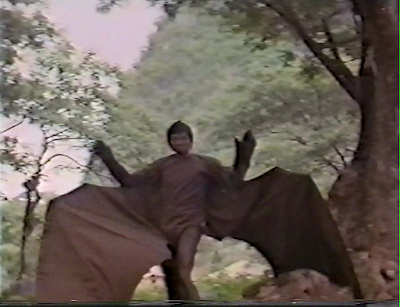 Back in 1974, a Filipino producer named Jimmy L. Pascual ended his two year run of Hong Kong-based kung fu productions and brought his film outfit to the Philippines to make a film called Devil Woman. Essentially a chop sockey cashing in on the kung fu craze like Pascual’s previous films (The Bloody Fists , The Awaken Punch  amongst others), Devil Woman is a rudimentary revenge saga with fantastic elements and snake motif, a familiar ingredient in Asian horror. Despite the regulation atrocious dubbing and wooden dialogue, Rosemarie Gil is positively regal as the snake-haired queen seeking revenge on the townsfolk for burning her parents alive, and the film was a minor hit, even receiving a theatrical run in the US, and has retained a small fanatical cult following thanks to Quentin Tarantino’s regular screenings. 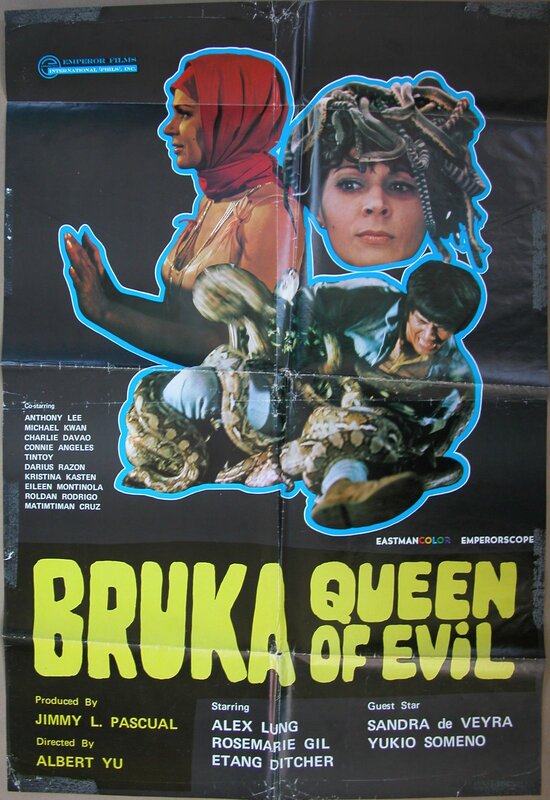 For years, fans of Devil Woman saw posters for a film called Bruka Queen Of Evil featuring Rosemarie Gil’s distinctive coiffure, and assumed it was one of Devil Woman’s numerous export titles. When a trailer finally appeared, the Devil Woman herself, Manda the Snakewoman, was indeed in the film – but with entirely different footage of bats, walking trees, and an army of little people. 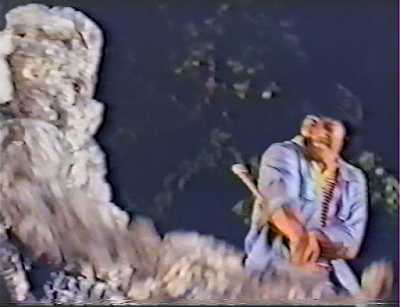 Was this the Filipino cut of Devil Woman for the local market merely redubbed and resold, or an entirely different film? Alas, no version of Bruka could be found, even amongst the most intrepid of Asian collectors. Imagine my surprise, then, to discover a copy of Bruka Queen Of Evil last month [NOTE: this was written in May 2011] in my post box. Ten minutes later, I can confirm Bruka is no Devil Woman. 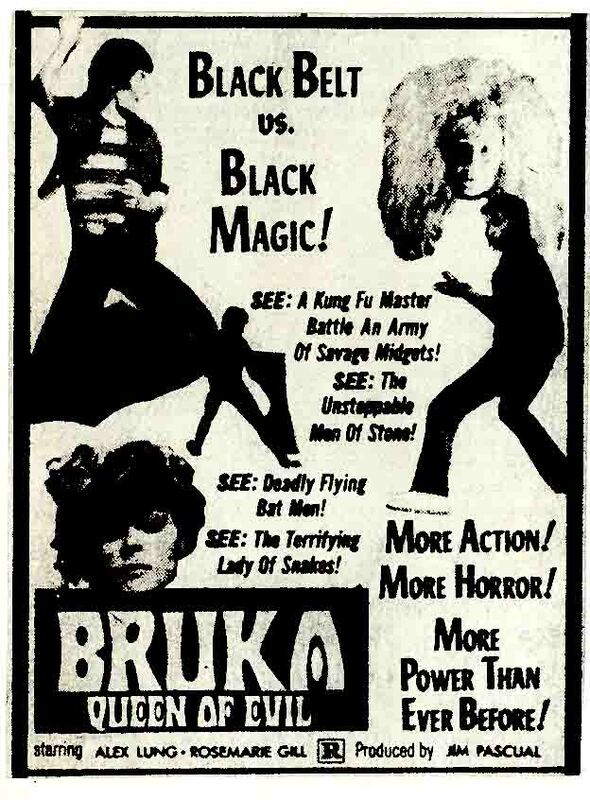 Although made by the same production team and with many of the original’s cast, its immediate sequel Bruka is an entirely different creature. A quantum improvement on Devil Woman, the film throws open Manda’s own personal narrative, giving her both a legacy and a destiny, and adds a new protagonist’s magical quest against a seemingly improbable array of oddities. Bruka begins as Devil Woman ends, with Manda engulfed in flames as she falls over a cliff. Miraculously she survives, and wakes in a cave next to a white-haired hag and a cadre of dwarves. “I’m your grandmother,” the hag Bruka declares, and to prove the point, unfurls her fifteen-foot snake body. She then shows Manda flashbacks to her birth in a crystal ball, revealing Manda’s mother to have chosen a mortal husband over her reptilian heritage. Manda’s so happy at the family reunion, she literally dances for joy! Surrounding her is a brand new arsenal for her protection: bats, rock creatures, tree-men, and shape-shifting dwarves into snakes. Veteran contrabida Charlie Davao is the test case, a poor villager who sees a figure under a sheet in his yard. 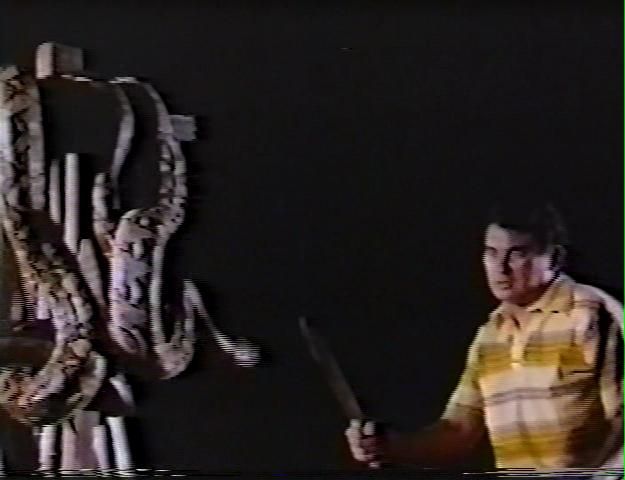 It turns out to be a wooden cross covered in reptiles who almost drown him in venom. 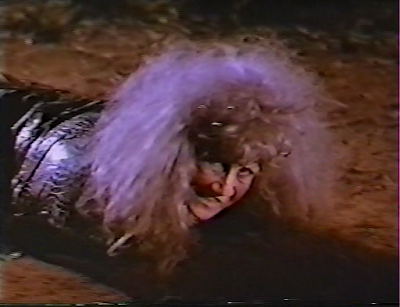 And with that, the Devil Woman sequel has already shape-shifted itself to the next level of weirdness. Grandma Bruka now gives her granddaughter a special gift – a black stone which turns her head full of angry snakes into human hair for as long as she keeps the stone in her mouth. To test the theory, she goes for a jungle stroll and kisses the first unfortunate hippie with a guitar who stumbles upon her. Spitting out the stone, the snakes pounce. Exssssscelent! In Bruka, Manda is no longed killing simply for revenge, and is instead awakening her true inner evil, and exploiting her outward normalcy to indulge her more primal, destructive instincts. 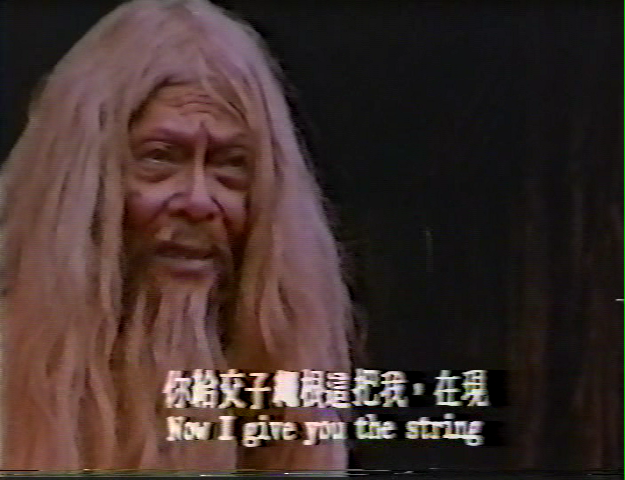 In Bruka, Manda faces a new antagonist in the shape of poor and angry Chinese Hong Pin (Pascual’s kung fu kicking regular Alex Lung). He takes on the job of finding rich Mr Tony’s daughter Louisa to buy food for his ailing family. In an eerily effective sequence he walks into a village obliterated by Manda’s snake scourge, bodies strewn everywhere covered in flies and bite marks, and he helps bury the bodies alongside a priest (Ramon D’Salva) and his hunchbacked assistant. The forest is full of peril, warns the hunchback, and Hong Pin must seek a hermit’s help. And as if on cue, Bruka’s dwarves burst into the church, dissolve into snakes and cover the priest and cripple. With the hermit’s rope-belt-turned-into-a-pole, Hong Pin makes his way through hostile territory, through all manner of creatures, to the cave containing Louisa and her virginal companions, all ready to be sacrificed to the Snake Queens’ insidious blood cult. 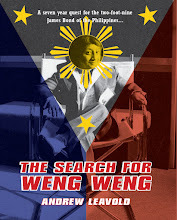 Pascual’s Philippines output for his Emperor Films International included another starring role for Lung, Dragons Never Die (1974), released in the US on a double bill with Devil Woman, and three Tagalog horror films released in 1975 alone for the local market (Isinumpa, Pagsapit Ng Dilim and Pandemonium: Lupa, Langit At Impiyerno). But if there was ever destined to be Filipino Lords Of The Rings with evil, fondling, Riverdancing hobbits and bleeding trees, this is the one film to rule them all. Those with a snake phobia, BEWARE; those with eyebrows ready to be raised and a keenly-honed appreciation of the absurd, enjoy, and I’ll see you at Ermita’s all-dwarf bar Hobbit House for after-movie rum cocktails. Did you consider exchanging with the best Bitcoin exchange company: YoBit.